The Samuel Blythe Society exists to acknowledge and celebrate the generosity of all those who intend to leave a gift to Clare College in their Will. We very much welcome the opportunity to thank our legacy donors for their support during their lifetimes, so when a member tells us that they have included the College in their Will, they are automatically enrolled into the Samuel Blythe Society. The society is named after the 17th century Master of Clare whose generous bequest to the College guaranteed its continuing success and prosperity. 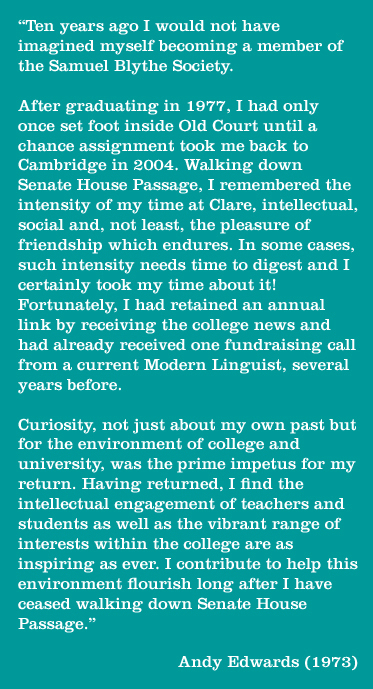 Over 300 alumni and friends have told us that they are planning to leave a gift to Clare in their Wills. As members of the Samuel Blythe Society they are invited, with a guest, to an annual luncheon in Hall hosted by the Master on the second Saturday in May. In recent years, members have also enjoyed a guided tour of the College gardens after lunch, a talk on the history and future of Old Court, fascinating talks by current students about their research and a tour of the Church of St Edward King & Martyr in Cambridge, where Samuel Blythe and three other Clare Masters are buried. Members are also presented with an enamelled lapel-pin (exclusive to the Samuel Blythe Society) bearing the Clare coat of arms.